Popular bingo format provides word recognition practice for 110 Basic Sight Words. Gives children practice in recognizing 110 basic sight words. 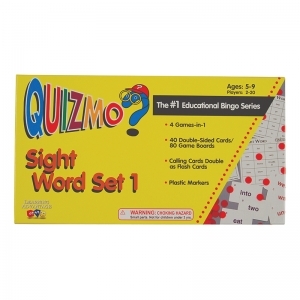 After playing Sight Word Quizmo® students will: Better recognize the basic sight words that they have previously encountered in their reading; Increase their ability to discriminate between words; Improve their reading skills; Look forward to more word recognition practice through an enjoyable activity. Designed for students at first or second grade reader level. Games increase in difficulty from Game A (easy) through Game D (most challenging). 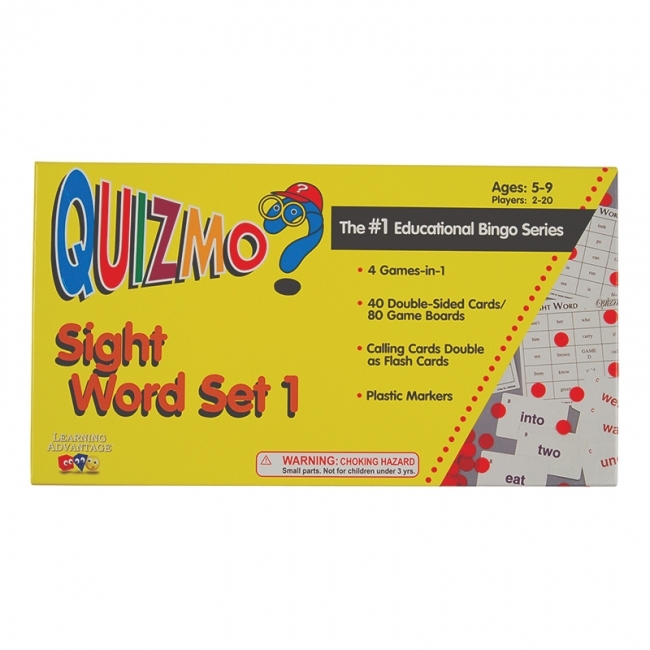 To accommodate up to forty players, just add a second Sight Word Quizmo®, Set 1 - the group can then enjoy a possible second winner for each round. Set includes 110 words in 4 different games at increasing levels of difficulty. For grades K-4. 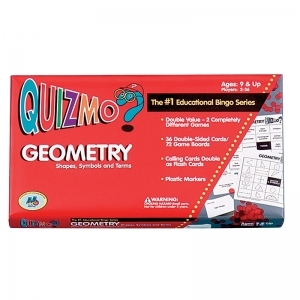 Geometry Quizmo® offers two levels of play. Features 36 game boards with the answers to the 140 questions. The front (TERMS) side has the scrambled answers that match the definitions of the red side of the calling cards. The back (SHAPES & SYMBOLS) side has the scrambled answers that match the terms/definitions of the blue side of the calling cards. Each game board has a "Free" space in the center. On the front side of the 70 two-sided (color-coded) calling cards, players answer with geometry term definitions. On the reverse side players match geometry shapes and symbols. Assess children's geometry knowledge with this Quizmo® game. Features over 50 basic concepts/terms and clean, accurate geometric illustrations for easy identification and interpretation. 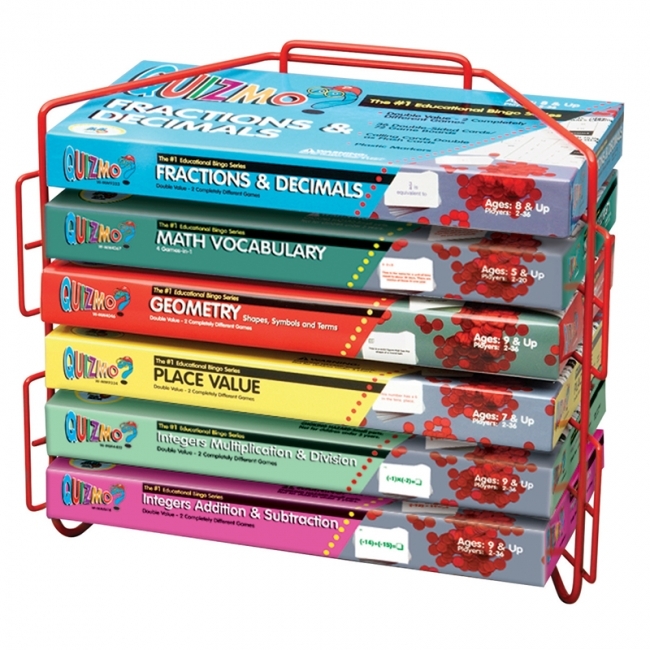 Includes 36 double-sided game boards, 70 double-sided calling cards, plastic markers and instructional guide. For grades 4-8. This series provides practice and reinforcement with some of the most challenging math concepts for students. 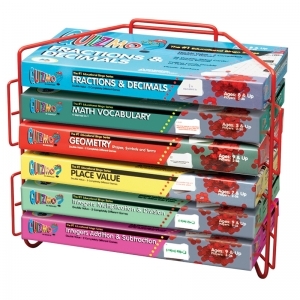 Includes Quizmo® Game Rack for easy game storage! Calling cards double as flash cards! 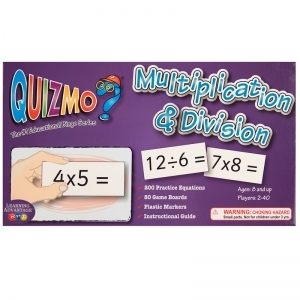 Quizmo® allows for multiple difficulty levels and the involvement of many players. It's no wonder that teachers and parents can't get enough of this Classroom Classic! 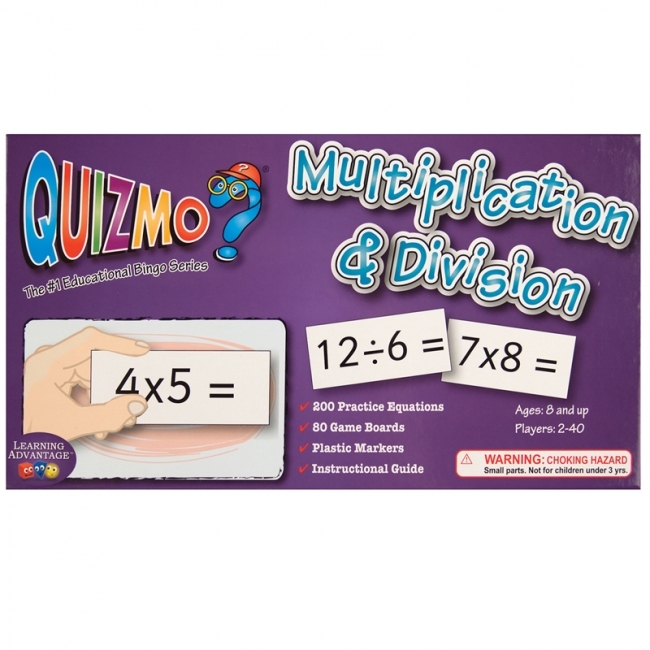 Quizmo® Games included in series and sold separately: #8242 Fractions & Decimals, #8238 Math Vocabulary, #8241 Geometry, #8240 Place Value, #8234 Integers - Add/Sub, #8233 Integers -Mult/Div. Contents include (quantities vary per game) game boards, calling cards, plastic markers, and Instructional Guide for teacher support.